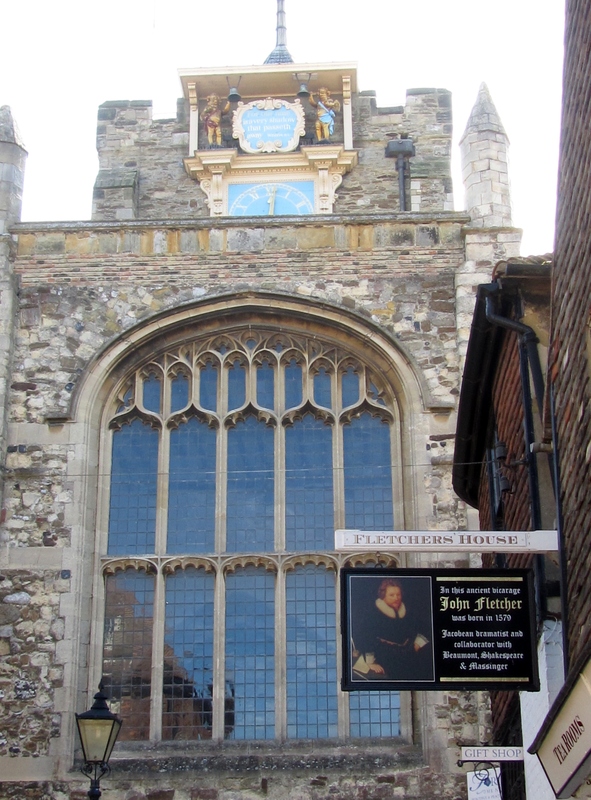 The medieval city of Rye is not far from Hastings so we hop on a double decker bus and head for the top floor. An old gentleman gets on at the next stop with an accordion slung across his back and a border collie in tow. It continues to be hot and as the bus fills with travelers we are glad that all the windows are open. We are charmed when the elderly gent breaks out the accordion and gives everyone a keyboard rendition of the song Summertime followed by a few other classic tunes. I appreciate the distraction because the bus is moving quickly down a very narrow lane, and I keep flinching as we pass roadside houses by mere inches. My line of sight has me looking directly into people’s rooms. Who would want a bunch of faces in a bus flashing by their living room every hour? 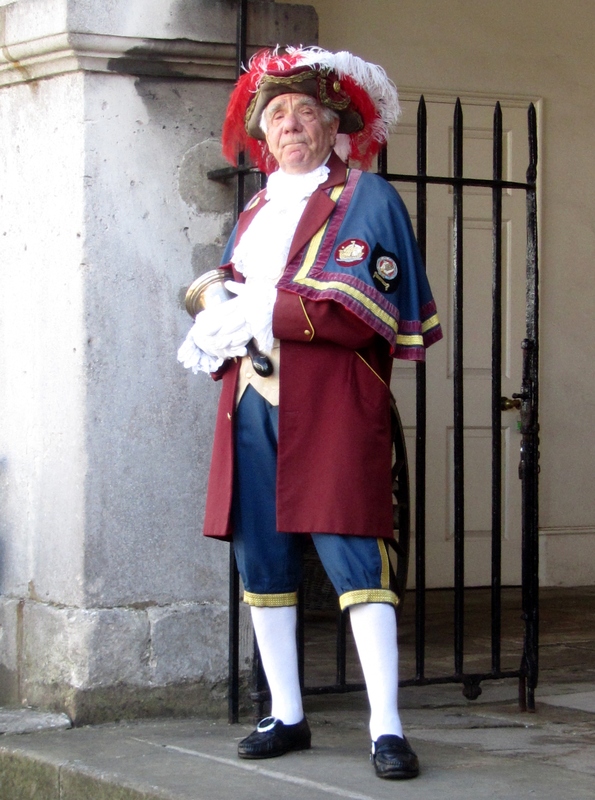 Off we get in Rye and find narrow sidewalks lined with compact old – really old – buildings. Some have signs saying they were renovated in the 1400s. (!) The streets in the medieval section of town are, of course, narrow and frequently are made of rocks set in some type of cement or concrete. Real, bumpy rocks that are difficult to walk on. Even in my sensible shoes I have to work at keeping my balance. Locals in dress shoes zip by, demonstrating their rock-walking abilities. Cars drive on these streets, with a whumpa-whumpa-whumpa sound that must make tire companies smile contentedly. 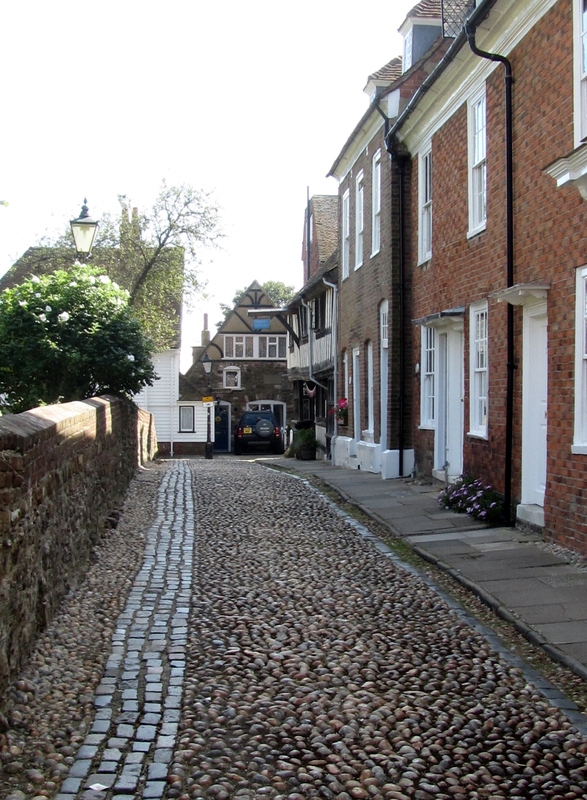 The rocky roads of Rye! 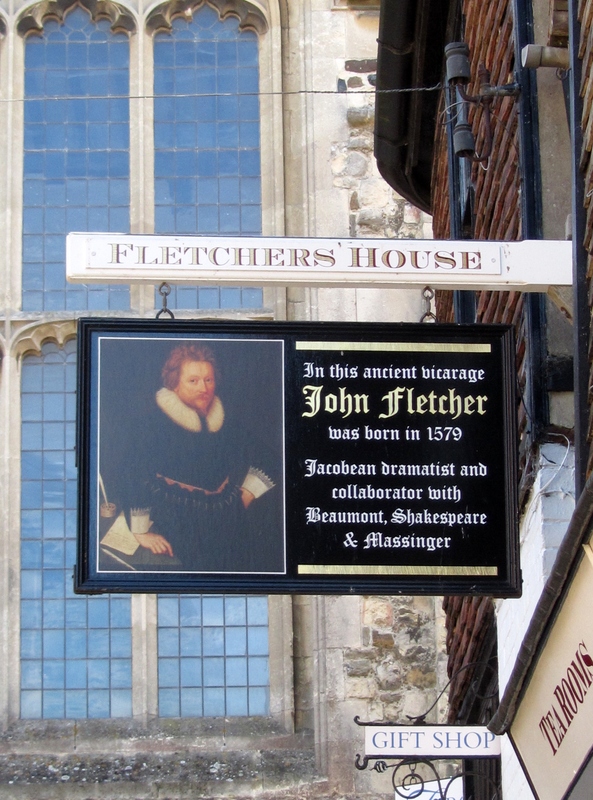 Up a hill and around a corner we see a sign marking the birthplace of John Fletcher, who entered this world in 1579. I don’t know much about this playwright, who was a contemporary of Shakespeare. According to the Francis Bacon Research Trust, he is thought to have collaborated with Shakespeare on Henry VIII and The Two Noble Kinsman. He was best known in his day for comedy, his most famous play being Knight of the Burning Pestle, which he wrote in collaboration with Francis Beaumont. Luminarian.org says that Fletcher probably was involved in writing about 42 plays, with a style that is “fast-moving, well-constructed and, in the case of the comedies, still funny.” I remember reading at the Globe Theater in London that Fletcher was more popular than Shakespeare for at least 100 years. Any writer who is still funny after 500 years is worth reading! I mentally add this playwright to my must-read list. Tomorrow we head to Cambridgeshire to visit with more aunts and cousins – this time on my father’s side of the family – and enjoy a trip to learned Cambridge. The quote on my email today is by Shakespeare! Sounds like you are continuing to find historical adventures around every hair raising corner! Or maybe I should say hysterical adventures!!!! You’re going to need to soak your poor tootsies once you get home!! Say hello to all of the family for me.